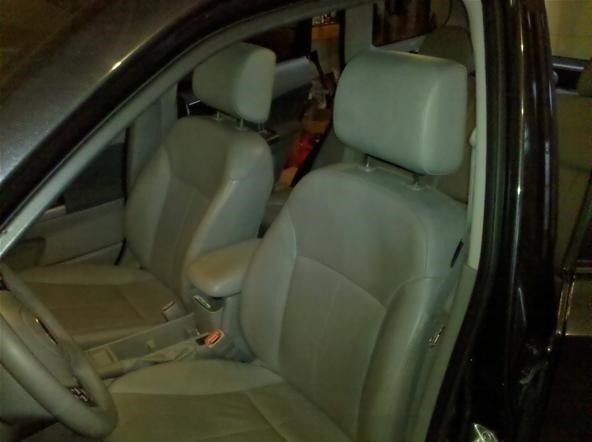 You could spend hundreds, even thousands for changing or replacing your interior. But you don't have to spend that much. The best part is, there's no need to remove any seats and in some cases the door panels. Anyone can do this. You just need to follow instructions, pay attention to details, have patience, have a garage, and you'll also need to be without a car for at least 24 hrs. 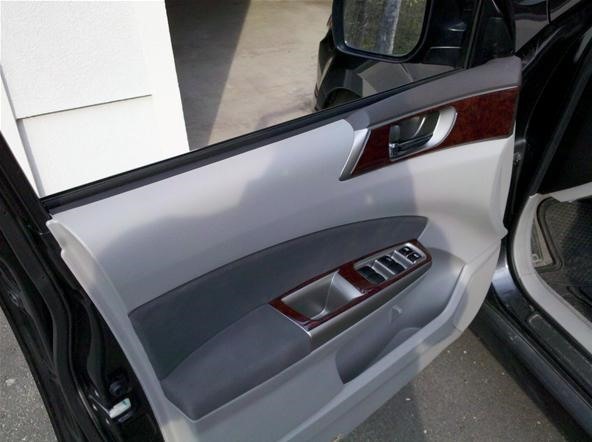 In this scenario, I painted my 2009 Subaru Forester's leather seat inserts and door panel insert using two different types of paint to give it a two tone finish. Every car's interior design and color is different. Planning which parts/sections to paint and choosing the right color is key to pulling off the two tone look. 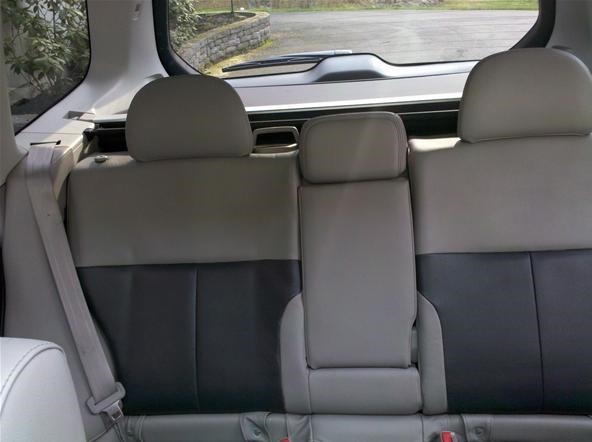 My interior is light gray and my exterior is dark gray metallic. In this case I decided to choose a darker gray to match my exterior. 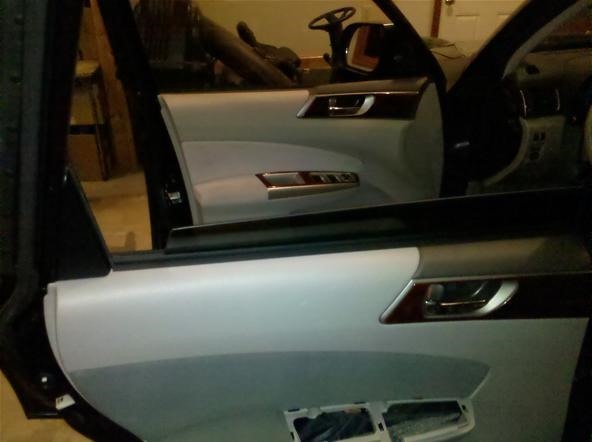 I chose to paint the middle perforated sections of the leather seats and the gray cloth inserts on my doors. So choose wisely and be sure to ask for a color swatch/palette from your interior paint's retailer. Seeing it on the computer screen just won't do. You'll need a physical comparison with each color represented and you should also choose your color in direct sunlight. 6 hours total prep and painted - 4 hrs seats, 2 hrs door inserts. Doing the project with two people would cut the time in half. Leather cleaner and/or fabric cleaner (do not use anything with oils or conditioner) - Lexor Ph leather cleaner is what I used. 1-2 magazines or catalogs, or anything with thick pages. Two cans of spray paint covered approximately 15 inches by 15 inches per section, which totaled up to 8 sections for me. Both cans gave me an average of 4 coats for all the sections. You may need more paint depending on the size of the interior and amount of sections. Estimate the same calculation if you have cloth interior. Use a clean microfiber terry towel or a damp paper towel to wipe off any dust, debris or dirt off the entire interior, including dash. 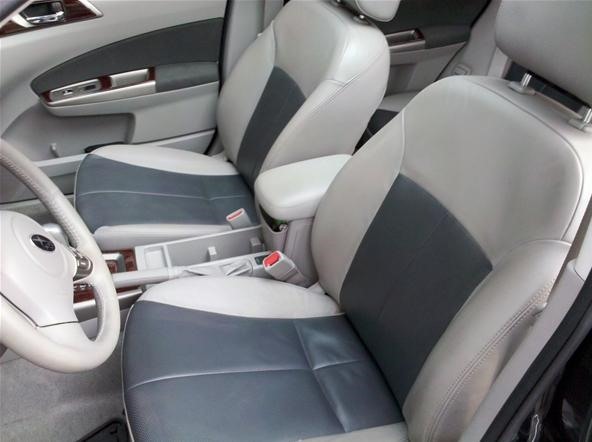 If you haven't cleaned your interior in some time, now would be the best time to thoroughly clean all corners, door trims, windows, vacuum carpet, etc. A clean environment is best when doing any paint job. 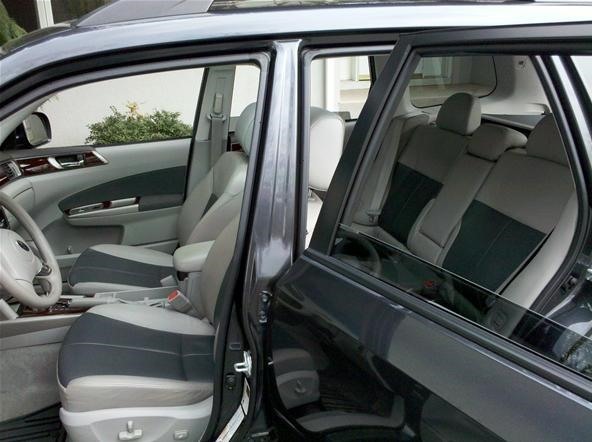 Clean all the seats and doors entirely using a clean microfiber towel and the leather and/or fabric cleaner. 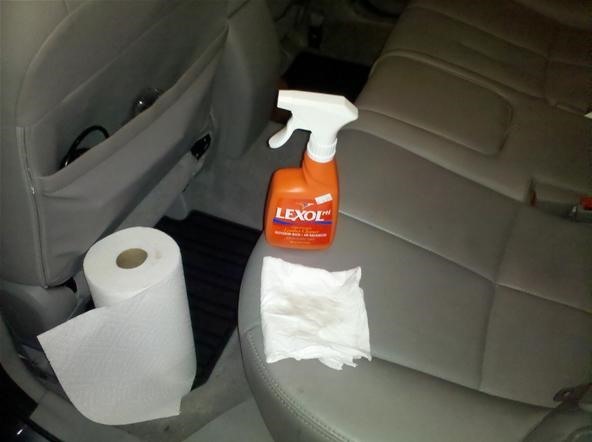 Spray evenly over seats and doors and wipe down using a little muscle. Avoid over spraying. Use the 600 grit sandpaper and lightly sand the sections to be painted. Note: this is for leather only. 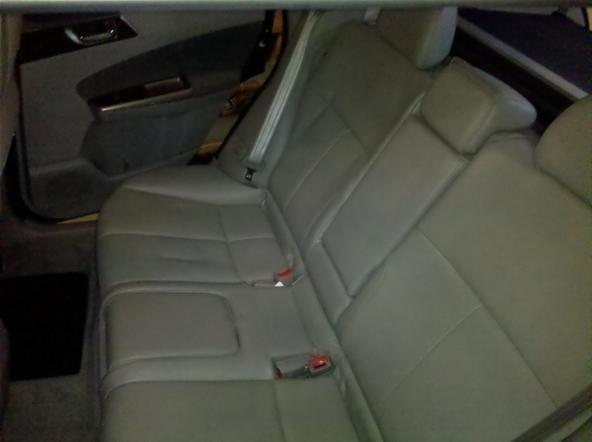 Next, repeat the cleaning process for all the leather seats and/or door panels using a clean microfiber towel and alcohol. Make sure to cover the newly sanded areas. This time pour the alcohol on the towel and rub it into the leather. Note: For fabric, skip alcohol rub down and allow the drying time as per the directions of your particular fabric cleaner's label. After the alcohol has been rubbed into the leather, let it dry for at least 20 minutes. 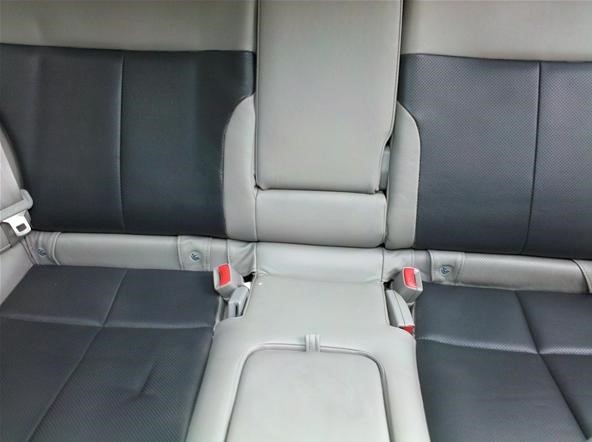 Make sure to recline your front seats for thorough cleaning and for helping in the masking process. Depending on the sections you choose to paint on your doors, some door panels may require you to remove door handles or window control panels in order to get the best results for cleaning and painting. I had to in my case for all 4 doors. Be sure to visit your manufacturer's installation and repair guides for further instructions on removing your specific panels. Lower all windows and open all doors. Make sure you're working in a well-lit, covered area. A dust-free garage is best and temperature should be between 65-70 degrees. 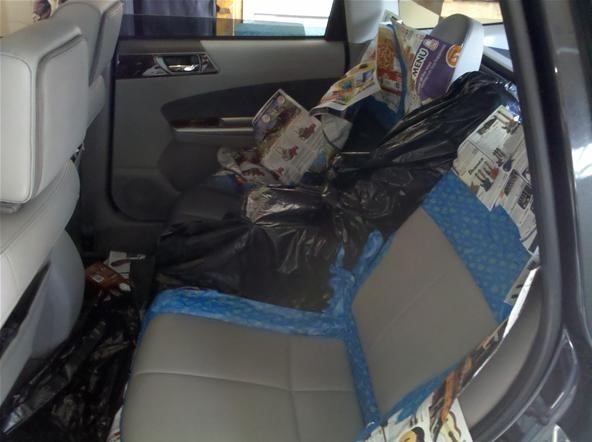 Now that your interior is clean, it's time for masking and covering. Using the masking tape, begin on the outlines of the sections to be painted. Follow outlines very carefully and continue to mask your way out at least 3 lines of tape width by overlapping the tape. In other words, mask your way outwards, and the tape should be overlapped side by side at least 3 times. 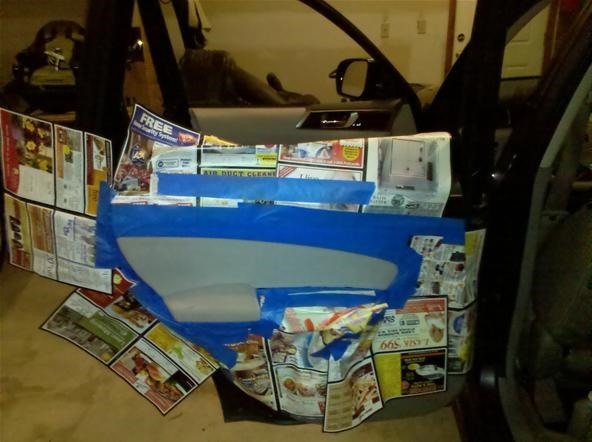 Be sure to pay close attention to detail and cover all the corners, seams, seat belts, etc. Take your time, and go slowly, making sure the tape sticks and you follow the outline of your sections. If you mess up, don't worry about it. Lift up the tape and try again. In some cases you might need to over lap the inner tape (tape that follows the outside of the outline) in order to cover all your outlines completely. Masking is the most important part of the project. The better the masking and attention to detail, the better the outcome. Don't rush it. Pay close attention to the outlines, curves and corners. For covering larger areas use the garbage bags and magazine paper. 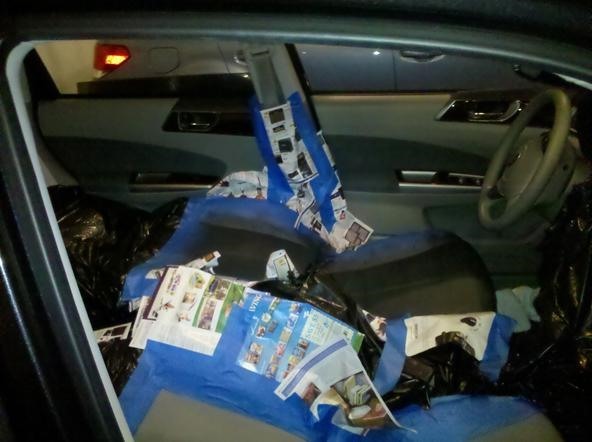 You can cut a garbage bag in half and cover your dash, middle console, and floor panels. Make sure you cover everything that isn't getting painted. 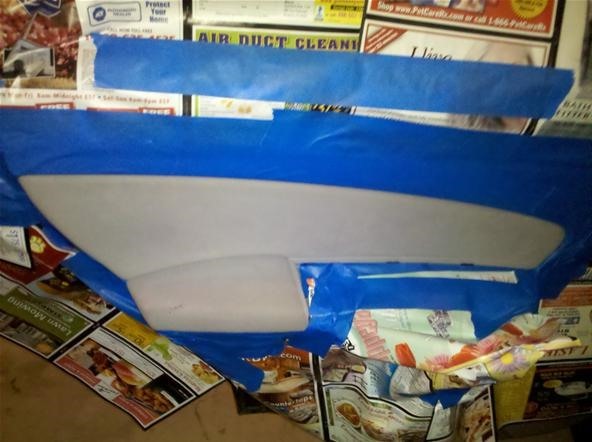 Cover the outside and underside sections of your seats and door panels using the magazine paper. Use an over lapping method when covering with the magazine paper. 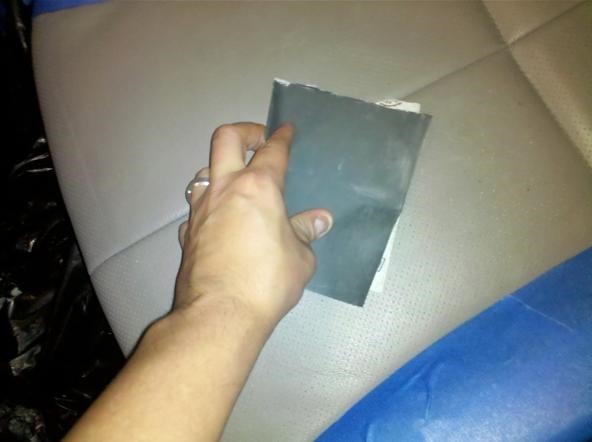 Once everything is masked off, wipe down the section to be painted again using the microfiber towel. Prepping and painting is best by doing it one section at a time. Smaller pieces of tape, about 6 inches in length work best for long straight lines. You will need to overlap as you go along the lines. For curves, 2-3 inches of tape is best by overlapping each other until you complete the curved area. If tape doesn't seem to stick properly, repeat cleaning process again on that section and be sure to let the alcohol dry thoroughly. 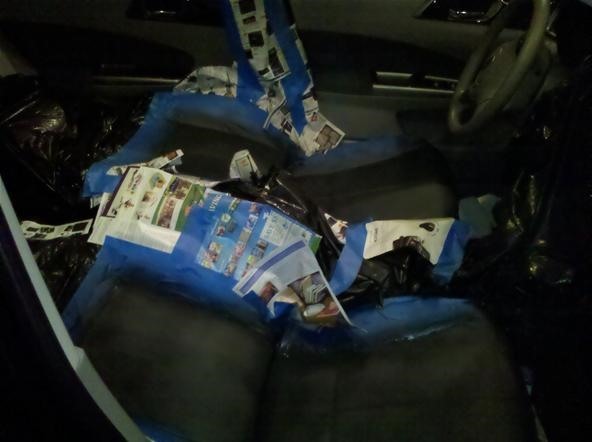 Also remember, if it's too hot, the tape may have a hard time sticking to leather and door panels. Make sure you're in a dry and cool place. Remember to recline the front seats to get better access for cleaning and masking. Use your finger nails or a flat screwdriver to get in-between crevices when masking. Be sure to use a light touch in order to prevent ripping the tape. Be sure to put on your mask, goggles and gloves. Shake your spray can well for at least a minute and begin with very light coats. Moving side to side (approximately 6 inches in width), in a medium to quick fanning motion at least 6-12 inches from the area to be painted. Allow 10 minutes in between coats. By the third coat you can go a little heavier. Total coats should be at least 3-4. Try not to go too hard on the spray to prevent drips. Multiple thin coats are better than a few heavy coats. Once all sections have been painted and dried for at least 30 minutes, you can remove all the masking and covering. Be sure to shake your can in between coats. If you're not sure of what the color will look like, try spraying it on a cotton t-shirt or paper towel. 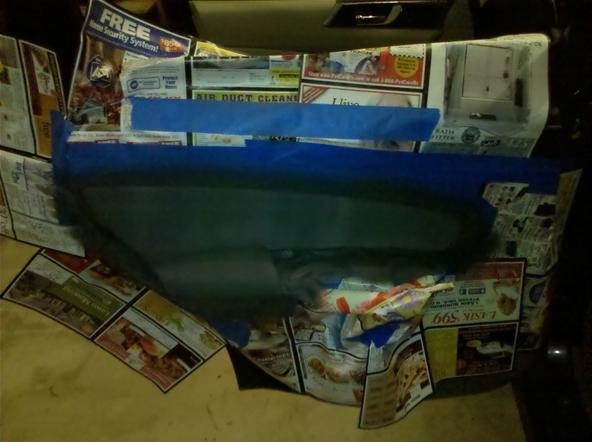 Painting the smaller sections, like the door panel inserts is the best place to start. 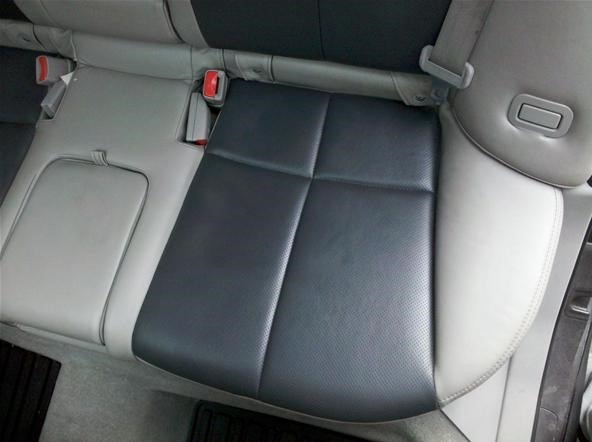 Try to get into the grooves and curves of your seats the best you can without over spraying to prevent dripping. Let the paint dry for at least 24 hours with the windows and or sunroof open. For the cloth sections, you will need the iron with the steam setting on. The paint will harden up the fabric, so you will need to loosen it up by lightly hovering the iron over the painted sections and letting the steam do its magic. Rub your hands into the fabric. Be sure it cools down a little before doing so. Look for any imperfections and don't worry about over spray or mishaps. Using the Goof Off or Goo Be Gone, spray a small amount onto a paper towel and wipe off the mishap and dry with another paper towel. Let the paint set for at least 24 hours and give the painted areas a quick clean with the leather and/or fabric cleaner. Lastly, use a clean microfiber terry towel and spray the leather with the conditioner. Use another clean towel to buff and dry. For more finer mishaps, spray a little Goof Off on a cotton swab or Q-tip and lightly go over the section. If the over spray is too close to the painted section, cover the painted area with the masking tape and clean off. If the opposite occurs and you missed a spot, re-mask and paint again. If it's a very small area you missed, mask around the area and use a cotton swab or Q-tip and spray a small amount of paint and dab the section. You may need to do this a few times. Let it dry in between coats. Try to leave the car in a shaded area for a couple of days for good ventilation and complete drying/adhesion. You now have a new interior that will be unique and sure to be a head turner. Feel free to contact me if you have any questions. Thanks and happy painting! wow this is realy perfect. I want to do somthing like this to my car I wonder if I can use different product names because I can't found your product in my country!!! Check out this site. They may be able to ship out of country. I was looking at the perforations. They don't seem to go through the leather, and the paint seems to have filled them somewhat. Can you do some closeups? I guess it is too late for before closeups.